Latham’s FinTech Industry Group is “built upon the firm’s deep expertise in the key verticals of technology transactions, financial services regulation, and emerging companies. Latham helps key market participants address a myriad of legal issues surrounding cryptocurrency and the application of distributed ledger technology. The firm provides sophisticated regulatory, enforcement, finance, corporate, tax, and intellectual property counsel to support innovation in highly regulated industries. A dedicated global team of more than 80 lawyers focuses on tracking and analyzing developments affecting the blockchain and cryptocurrency industry, spanning multiple practice areas within the firm. 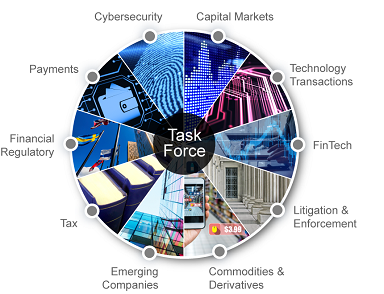 The Latham team includes former enforcement supervisors and prosecutors from the US Commodity Futures Trading Commission, US Securities and Exchange Commission, UK Serious Fraud Office, UK Financial Conduct Authority and the Securities & Commodities Fraud Task Force of the US Attorney’s Office for the Southern District of New York, as well as former senior US Department of Justice officials. Guiding one of the world’s leading blockchain technology companies through cross-border legal and regulatory challenges as it establishes venture capital, asset management, and token advisory services, places venture investments, acquires firms, and develops numerous “spoke” projects. This work covers financial regulatory, tax, and fund issues, in jurisdictions throughout Asia, Europe, the Middle East, and the US. Representing token trading platforms and ICO issuers facing SEC investigations. Advising several of the world’s leading cryptocurrency exchanges on global regulatory issues.